combinations of firing that can be obtained by positioning of the two rotary selector switches (BURST RATE and SINGLE/DOUBLE) on the pod control indicator. There is also a reset switch and reset light indicator on the pod control indicator so the intervalometer can be recycled to the starting position. Cockpit Control Indicator The cockpit control indicator (fig. 10-26) is an optional feature of the dispensing set. The controls on the cockpit control indicator override those on the pod control indicator, letting the operator select the burst rate and dispensing pattern after the aircraft is airborne. In addition to the burst rate and single or double rotary switches, the cockpit control indicator has four pod select switches, a power ON switch, and four chaff remaining counters. This gives the pilot individual or simultaneous control of four separate dispensing sets while airborne. The cockpit control indicator has no reset feature. When the aircraft doesn't use the cockpit control indicator, any 28-volt dc power source having a cockpit control switch may be used for operation. When the system is used, the burst rate and dispensing pattern are controlled by the preset controls on the pod control indicator. For further information on the AN/ALE-37A chaff dispensing set, you should refer to Countermeasures Chaff Dispensing Set, AN/ALE-37A, NAVAIR 16-30ALE37-1. REVIEW NUMBER 5 Q1. What chaff dispenser is installed in Navy combat aircraft? 10-23 1. Left outboard counter 2. Left outboard pod activate indicator 3. Left outboard pod activate switch 4. Left inboard counter 5. Left inboard pod activate indicator 6. Left inboard pod activate switch 7. Right inboard counter 8. Right inboard pod activate indicator 9. Right inboard pod activate switch 10. Right outboard counter 11. Right outboard pod activate indicator 12. Right outboard pod activate switch 13. Power switch 14. 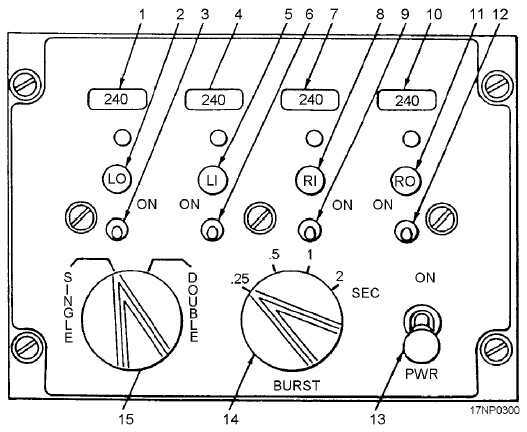 Burst rate selector switch 15. Single double selector switch Figure 10-26.Cockpit control indicator.